He wanted to be 'Internet famous' and, well, now he is. Each mug contains around 10 eggs, meaning that the man had approximately 50 in total. He wanted to be 'Internet famous' and, well, now he is. 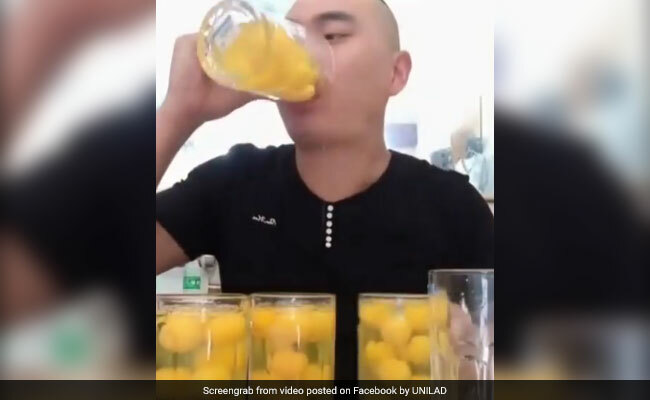 In a bizarre video, a man in China guzzles down five beer mugs filled to the brim with raw eggs in less than 20 seconds. The short clip, posted to Facebook by UNILAD, is viral and has been viewed over six million times with many asking why he would pull such a stunt. In the footage the man can be seen gulping down the raw eggs from five glass beer mugs stacked in front of him. Each mug contains around 10 eggs, meaning that the man had approximately 50 in total. The man doesn't even flinch as he swallows the eggs, barely pausing to breathe in between gulps. He ends triumphantly, making a victory sign at the camera, after swallowing all the raw eggs. According to some reports, the man was live-streaming himself drinking the raw eggs. Live-streaming is becoming incredibly popular in China, reports the Daily Mail, with people performing "crazy stunts in order to become famous." The stunt appears to have served him well, as the man reportedly gained many more followers on his live-streaming account. People on the Internet have pointed out that there are better, more creative ways to increase followers on social media for the stunt can be potentially dangerous. Uncooked eggs can be a source of the harmful bacteria Salmonella.